Earlier in 2011, I blogged about the town of Slave Lake, Alberta and the blow it was dealt in the form of a very destructive fire. At my aunt's house this afternoon she showed us a beautiful hand stitched quilt that was given to her through a program called "Blanket Slave Lake With Love". I always hear about different situations where people contribute their handmades for people who have been through a difficult time. 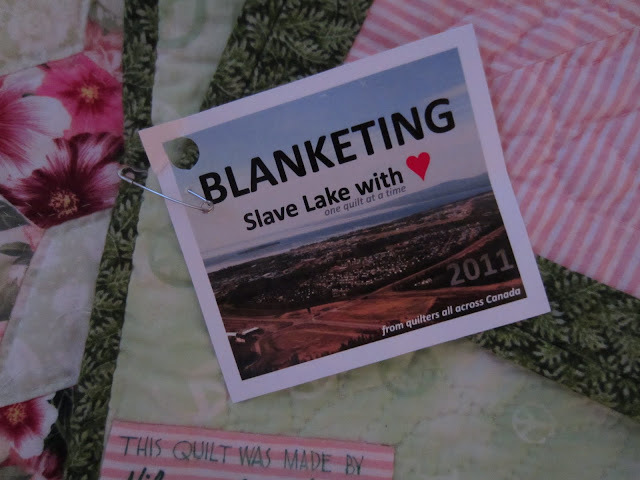 Someone invested their hard work, and their time (which is invaluable) in to creating this quilt for someone they have never met. Even more than that, a hand stitched quilt can not come together without an incredible amount of dedication, love, and care. That is an intensely personal, invested gift, and truly, who would not be uplifted by such a gift? In my aunt's words "It felt like [she]'d gotten a cuddle". Oh that is heart warming. I love this! It is a beautiful sacrifice of a caring person's time and resources. How wonderful! I need to look into this program more, it sounds like a good way to spend some craft time.